DMM wanted to lighten this carabiner substantially so that the benefits from the roller weren't compromised by being too heavy. By hot forging the back, creating lightening panels (I Beam) they were able to achieve this, and also create a very unique and stylish look. 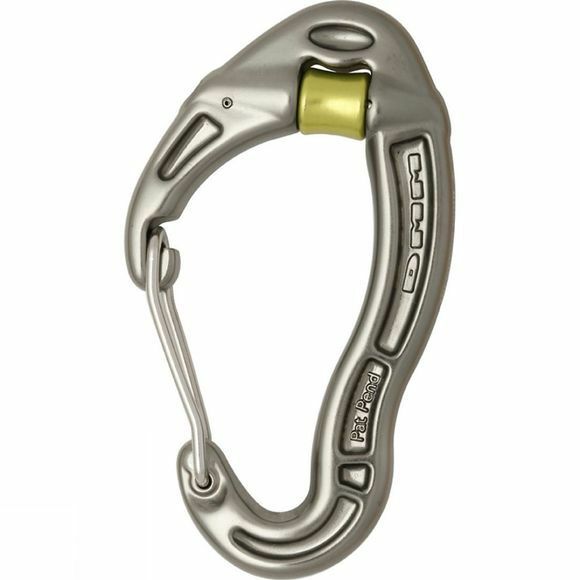 In simple terms the carabiner uses rolling friction rather than sliding friction as in a normal carabiner when the rope runs over the carabiner bar. In this case the rope rolls over the pulley wheel which means much less friction is created. Less friction means less force holding the climber back which makes upward progress a lot easier. However, there are other important factors to consider too. Since the rope rolls over the roller there will be less wear and tear on your rope which will increase its working life considerably. Also, by reducing the friction, the forces involved when a climber falls are more evenly distributed throughout the system, resulting in less force being inflicted on the last piece of protection placed. If this last piece is marginal, it could be a very real benefit. Lastly, the Revolver also offers you options in terms of rigging hauling systems or improvised rescue, as it works just like a small pulley, making this carabiner a very versatile piece of kit.